JEWELRY THAT MAKES A CLASSY STATEMENT! Vladimir was born in Moscow, Russia, where he currently lives and creates. Everyone in his family loved knitting, from his grandmother to his sister, and Vladimir learnt the craft from them at a tender age of 5. He started making female fashion accessories in 2011, while working full time at a bank. 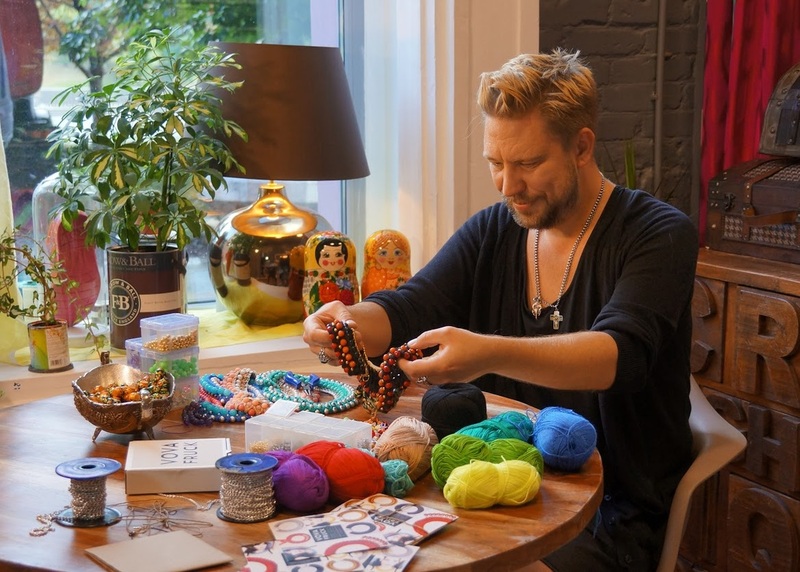 One night he just came home and made a necklace for his wife, and then her sister wanted one, and the mother-on-law, and their friends, and so on... What started as a simple hobby grew into a full-time passion and business for Vladimir. Since then, his works have grown in popularity in Russia and have been featured by local celebrities – singers and TV stars. Each necklace is 100% made by Vladimir himself with all his love and passion for the beauty. Vladimir loves to travel and he often gets his inspiration from the places he visits and people he meets. His dream is for every woman in the world to own one of his pieces. All of the products under the Vova Fruck brand are handmade by the designer. Each model is meticulously put together, using only the highest-quality Russian-made top-grade yarn, precious and semi-precious stones and metals, corals, beads, which are sourced from all over the world. All of the materials that go into Vladimir's products are personally selected by the designer. Vladimir loves to use traditional Russian elements like Matryoshkas (nesting dolls) in his necklaces. All the matryoshkas are hand-made and hand-painted by the craftsmen in Tula, Russia. A little story behind this collection. It was created during the months of January and February – cold, grey, winter days when the sky is low when the excitement of winter holidays is way past you and warmth of spring is not in the sight yet. It was during these days that I created my “Color me bright” collection. It is inspired by the longing of warmth, vacations, travels, friends, and simply having fun and being a little careless. This collection reminds us that we are responsible for the way we feel and we can always choose to add a pop of bright colors and to feel happy no matter what the external circumstances are. I am a firm believer that the way we dress can influence the way we feel. I hope that "Color me bright" collection will transform not only outfits but the moods as well.